Talk about an explosive cliffhanger. 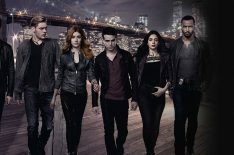 Last night's Shadowhunters two-hour midseason finale was one wild ride after the next! So many crazy moments went down that we can hardly catch our breath. From Magnus (Harry Shum Jr.) giving up his magic to save Jace (Dominic Sherwood) only to leave himself completely helpless alongside a dying (?!) Alec (Matthew Daddario), to Simon (Alberto Rosende) blowing up (?!?!) Lilith (Anna Hopkins) and potentially Clary (Katherine McNamara) — we can't wait to see what's in store for Season 3B. TV Insider sat down with McNamara to chat about what's next for Clary and what the rest of the gang. "Nobody escapes the events of Episode 10 unscathed," she explained, adding, "It'll be interesting to see how all the characters deal with the loss [of Clary]." Check out the video below for more scoop on Season 3B and Kat's answer to the question everyone will be asking after the episode: Is Clary Dead?! What do you think happened to Clary? Let us know in the comments below!